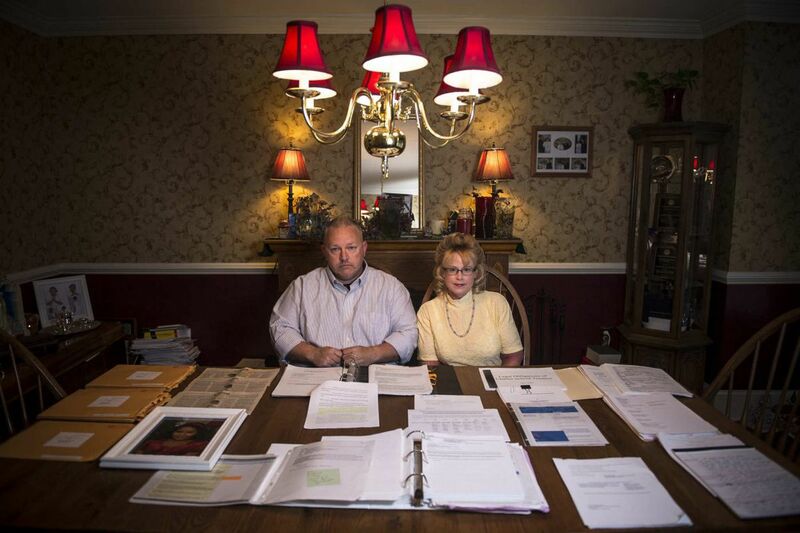 Angelique and Ira Smith in 2016 sit in front of documents and files from a defamation case that lasted more than seven years before being dismissed. When a defamation suit against several former Agora Cyber Charter School parents ended in 2016 after 7½ years, two of the parents vowed to sue Dorothy June Brown, the founder of the school, who had targeted them. Ira and Angelique Smith, who said legal expenses from the case caused them to fall behind on mortgage payments and lose their home in Parkesburg, Chester County, have made good on that promise. The Smiths have sued Brown for wrongful prosecution. Also named in the complaint filed in Montgomery County Court are charter schools and businesses Brown worked with or created. The couple are seeking more than $50,000 in damages, punitive damages, and attorneys' fees for years of emotional and financial hardship they allege Brown caused because they questioned the operation of the taxpayer-funded cyber school, which enrolls students from across the state. The slander and defamation suit Brown lodged in 2009 alleged that parents had made statements implying that she was "corrupt, incompetent, and possibly criminal." In their counter suit, the Smiths allege Brown filed the defamation suit and continued it without believing in the truth of its claims with the intent of harassing and maliciously damaging the couple and other Agora parents. Among other things, the parents had expressed concerns that a management firm Brown had created — Cynwyd Group LLC– was being paid by Agora for services that were being performed by K12 Inc., a for-profit firm in Virginia that was contracted to provide management and technology services. The defamation case was put on hold after federal authorities charged Brown with defrauding Agora and other charter schools she had founded of $6.5 million in 2012. During five weeks of testimony in 2013 and 2014, federal jurors at Brown's criminal trial heard accounts of phantom charter school board members, fabricated documents, and forged signatures on contracts that benefited Brown or her management firms. In January 2014, jurors acquitted Brown on six counts but deadlocked on the remaining 54. Her retrial was canceled when a federal judge ruled in late 2015 that the veteran educator was incompetent to stand trial because she had dementia. Brown is now 80. The Montgomery County court docket does not indicate who is representing her in the Smiths' suit. Her husband, William H. Brown 3rd, senior counsel at the Center City law firm of Schnader Harrison Segal & Lewis LLP, could not be reached for comment. Matthew B. Weisberg, one of the Smiths' attorneys, said in an email: "While it is this firm's policy not to discuss the merits of our clients' cases, we can say that our clients vigorously believe in their case and we are looking forward to a successful adjudication." In addition to Brown, the Smiths are suing Brown's two management firms — Cynwyd Group and AcademicQuest LLC; K12; and the former Planet Abacus Charter School in Tacony. Brown founded that school, which later changed its name to Keystone Academy. Brown has not been involved with Agora, Keystone, or any other charter school for several years. Agora and K12 said they do not comment on lawsuits. Keystone Academy's attorney could not be reached. The Smiths and other former Agora parents Brown sued have maintained that they were targets of what is known as a "strategic lawsuit against public participation" (SLAPP) suit, which First Amendment experts say can have a chilling effect on free speech. Angelique Smith testified in 2014 in favor of proposed state legislation that would have provided greater legal protections for citizens who speak out on matters of public importance. At a state Senate Judiciary Committee hearing in Philadelphia in 2014, she said SLAPP suits "often take the language of 'defamation' suits to give credence to frivolous lawsuits and to facilitate judicially sanctioned class warfare." Brown and the attorneys who handled her defamation case denied it was a SLAPP suit.